Along with shopping for bathers, this has to be one of the least pleasant shopping experiences for a lot of ladies. Getting those pins out after months spent away from the sun’s rays can be a bit confronting to say the least. And, guess what? It’s that time of year again. Time to book that wax and slap on the fake tan. To make your life a little easier for you and to take a little sting out of the whole experience, we’ve tried and tested a few pairs out there and have found our favourite pair which we think you will love. Before we share them with you though, we’ve put together a little list of our top tips to help you get short-savvy this Summer. K. A big fat no-no for us is women over 35 in 3/4 pants masquerading as shorts. They are SO not the same thing. Not. The. Same. Thing. We have no idea why certain shops keep dragging them out every Summer but they are out there again this year so please BEWARE. Next to a perm & set and a blue-rinse, this is the simplest way to add 20 years to a person. And please don’t get us started on the Katmandu-esque zip-off at the knees variety. If your name ain’t Bear Grylls, you have no business wearing them. Now that’s out of the way, we will now continue. The most flattering shorts are flat-fronted. This means no pleats or big pockets. If you are short waisted (like we are) go for lower rise or mid rise shorts. We like to go up a size so that they sit lower, on our hips. If you are long waisted, the opposite applies so try the high-waisted variety. Remember you don’t need to tuck in your top, a front-tuck will suffice. The ideal length will vary from person to person but we find the perfect length for most people is half-way between the top of the thigh and the top of the knee. 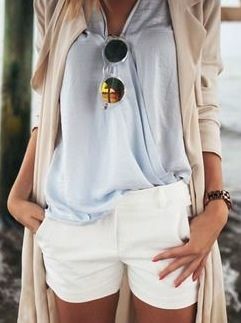 Tailored shorts with a cuff are very flattering and look great with a heel (particularly wedges) to elongate your leg. The biggest tip we can give you is to ignore the size tag! #ignorethesizetag. Try on lots of pairs in a range of sizes and go for the shorts that are the most comfortable and flattering. Remember, shorts hardly date so take a little time and find that perfect pair. Without further ado, we proudly present to you our favourite pair and a how-two-style for day and night. 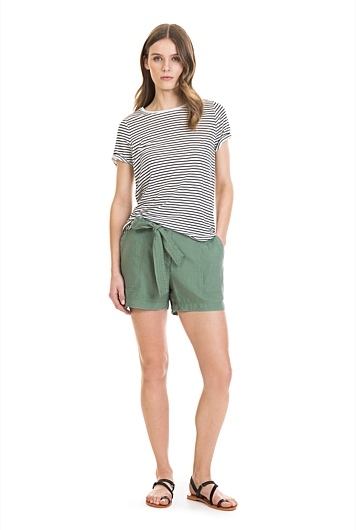 We’ve found these Country Road shorts are perfect for Summer. In lightweight linen in a relaxed shape, they suit most shapes and come in this gorgeous sage colour as well as black, white and sand. $89.95. Please click here for more information. We don’t take shopping for shorts lightly and if you need a hand, please let us know. We’d love to hear your feedback on what you think of these shorts and whether you’ve seen any out there that are worth a mention.